Imprint logos. Custom wristbands are a walking mini billboard. Let’s say your company sponsors or hosts an event. 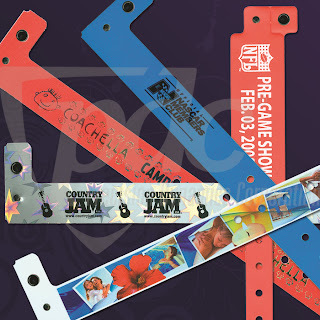 Custom wristbands can serve double duties: branding and security/crowd control. When guests have a great experience at your event, they will likely keep wearing the wristband for days or weeks to come. It can become a conversation starter wherever your guests may roam—the water cooler, hairdresser, grocery store, and the like. To more effectively spread the word, you could imprint your company’s website address on the wristband. In this day of social media, it’s highly possible that some of your guests may get on Twitter or Facebook and tweet or post your website address, and then comment about the fabulous time they had at your event. Imprint custom coupons.When you distribute wristbands at an event hosted or sponsored by your company, custom messages can be printed. You can turn the event wristband into a coupon by printing something like, “get 10% off product X with this wristband” or “show us your wristband and get $20 off when you spend $100.” In addition to promoting your company from their wrist, an imprinted coupon serves as incentive for guests to take action and purchase your company’s products or services. Imprint quick response (QR) codes. Have you noticed those little two-dimensional barcodes popping up in surprising places? You may have seen them on business cards, in magazines, on flyers and coupons, even on badges and articles of clothing. For those with smart phones, these codes contain information, offers, and freebies that can be accessed on the go and sometimes exclusively. QR codes imprinted onevent wristbands can be used to offer almost anything from discounted ticketsfor upcoming events to buy-one-get-one-free lunches. They can link to anything from a continuously updated playlist at a DJ night to an updated schedule of seminars at a tradeshow or all-day conference. Have a team-building car wash.Promote your organization by hosting a car wash, while simultaneously building teamwork and communication. With the logo or slogan imprinted onthe event wristbands, you can hand them out to further promote your business. At the end of the day, multiple people will be walking around town advertising your company by wearing it on their wrist. Organize a pub crawl for a charity. Why not have a little fun while raising funds for an important cause that your company supports?Wristbands can enhance the experience for participants because they become easily identifiable to bouncers, bartenders and wait staff at each tavern stop. All participants need to do is flash their wristbands to gain entry into the establishment and fetch drinks from the bar. No worries about digging for a ticket or card in a purse, billfold or pocket. Chances of losing a wristband are practically nil because it is comfortably worn around the wrist. Designate VIP Access. If you are hosting a corporate or fundraising event at a public site, like a large hotel, event wristbands are a strategic way to provide access control and promote your organization. You could line up guest speakers or celebrities to draw in crowds of people to attend your event. Different color event wristbands can designate different groups of people. Perhaps red indicates the guest is authorized to attend the speaking engagement, while green lets security know the guest is allowed back stage to meet the speaker when the presentation is over. Different color wristbands can also be used to honor VIP donors or volunteers who maybe have special access. Hold contests or raffles.You can use serial numbered wristbands for special promotion contests or raffles. If you're hosting a raffle at your business or event, using serial numbered event wristbands with pull-off tabs are easy to use and fun for the participants. Each person who buys an entry to your raffle gets a wristband to wear and removes the detachable stub, which serves as the ticket stub. The stub is entered into the raffle. When the winning numbers are announced, each person just checks the wristband adorned on their wrist. Good bye lost tickets! There are seemingly endless possibilities to promote your organization or event with wristbands. Get creative and have fun with this easy, affordable promotional tool!